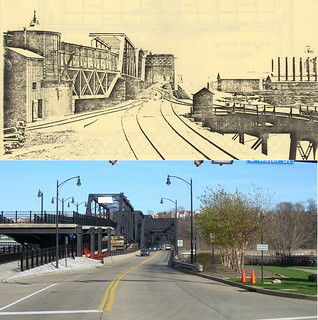 The upper photo is what it looked like when the Hot Metal Bridge (left) and the Monongahela Connector Bridge (center) were a shuttle between mills on opposite shores. It was taken from the cover of a publication called "Bridging the Past and the Future" and I'm guessing that it was part of the proposal documents for the reuse of these abandoned bridges. I've only been able to find the one image on the web. 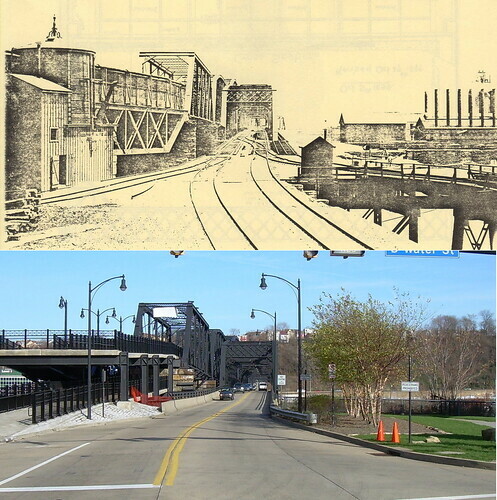 The lower photo, taken from pretty much the same location now that both bridges have been retasked, the Mon Conn Bridge for automobile traffic and the Hot Metal Bridge for bicycles and pedestrians.